Black Friday/ Cyber Monday 2018: Air Compressors Deals, Discounts!! If you are looking for a true deal of air compressors during this Black Friday/ Cyber Monday 2018, we are covered here to guide you find the best model with less money. 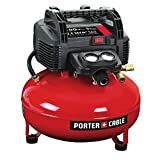 There are 3 models with huge discounts available today: PORTER-CABLE C2002 Oil-Free UMC Pancake Compressor, California Air Tools 5510SE and Kensun AC/DC air inflator. PORTER-CABLE C2002 is the best selling pancake compressor over years. This unit has a 6 gallon tank and it is very lightweight (around 31 lbs.) for portability. Max tank pressure is 150 psi and it can deliver 2.6 scfm at 90 psi. At the moment this unit is available with 29 % discounted. California Air Tools 5510SE is a quiet model (under 60 dB) which is the best option for users who need to work indoor constantly. You can choose steel tank or Aluminum tank (5.5 Gallons) design. This unit is available with 40% discount. Kensun AC/DC air inflator is the best option for pumping tires, pool toys. The unit is only about 5 lbs. You can save 21% and there is a coupon with 10% more discount at check out. Some popular use air compressors such as pancake designs and wheel & tire designs will have more deals and discounts while stationary, professional-grade design will have fewer deals and discounts. At the moment, we have tracked several most popular models with deep discounts are available as follow. You can check for the price of them by clicking on the link. A famous and popular pancake air compressor that works very well and easy to carry around. It holds great pressure and has strong airflow but still it noisy. You can use this little portable compressor for tires, sports balls, toys, short burst air tools like guns or stapler. At this moment, this model has a a good price up to 29% discount. This is the best seller for those who need a wheel and tire air compressor. It is very cheap, durable, ultra-lightweight. The unit can use for cars, bikes, sedan, small and middle size SUV. You can also adjust the display units in Psi, Kpa, Bar, and Kg/cm as your preference. The best part of EPAuto unit is the capacity to shut up automatically when the desired pressure is reached. The whole unit is just under 3 lbs and this is the number one choice when talking about tire compressors. Auto shut off when reaching desired pressure and overheat protection shuts off. At this moment, this model has discounted already with 14% off. California Air Tools 5510SE is a popular air compressor with low noise. The maximal noise of this model is just under 60 dB, ensuring you won’t bother your neighbors. This unit is designed for long lasting (no oil pump and 3000 running life before Wear). The whole unit is just 46 lbs and it is supported by wheel kits for easy moving. California Air Tools 5510SE is suitable for various jobs like tire inflation, drills, ratchets, air chisels, and gun nail. It is a great option person who works indoors and noise is a great concern. At the moment, this unit has a great discount up to 40%. Do not miss the discount as it may end soon. Bostitch BTFP02012 Oil-Free Compressor is a great value for users who need a small, portable air compressor with strong airflow. This model can reach 150 max PSI and 2.6 SCFM delivered at 90 PSI pump, making it one of the most powerful compressors at this range. Particularly, the whole unit is about 31 lbs which are far lighter than other brands. Bostitch BTFP02012 Oil-Free Compressor is a great choice for framing, tires, nail gun, dusting things and more. However, this unit is a bit noisy (up to 78 dB) so you should aware of its noise level before buying. On Black Friday, Bostitch BTFP02012 Oil-Free Compressor does not have discount at this time. California Air Tools 10020C is a high rating, a popular model designed for the workshop, garage where a continuous stream of airflow is needed. This unit is very quiet, you can run it day and night without bothering your neighbors. In facts, it is rated as one of the quietest air tools with 2 HP motor (70 dB max). This model has a sturdy design, strong airflow and it can hold air for weeks without leakage. The whole unit is about 85 lb and it is supported by wheel kits for moving around. One thing you should realize that California Air Tools 10020C uses 1/4’’ connector, so check your pneumatic tools hose diameter size to see if it fits. 10 Gallon Steel Air Tank With Wheel Kit: easy to move around. At the moment, California Air Tools 10020C doe not have discount so far. You can check for the current price here to get the best deal of this model as it is a bit expensive on over the year. Black Friday is a good chance for investing such as a great performed machine. Kensun portable air compressor is a great machine at a good price with thousand feedback. Unlike EPAuto 12V DC Portable Air Compressor Pump, this model from Kensun brand can use with both AC/ DC power source (there is an adapter inside the package). It works amazingly when you are trying to inflate or deflate tires, sports toys and it also has the automatic shut off feature when the pressure is reached. Kensun portable air compressor is a good option for family, lady, the person who needs a portable, convenient air pump for their cars and pool toys. 2 years warranty from the purchasing date. Currently, Kensun portable air compressor is available with a good price, up to 21% discount + an extra coupon to save more. Helteko Portable Air Compressor Pump 150PSI is a great tire inflater at a low price. It is very easy to use and one plus point is that the cord is quite long (3.5 m), longer than other rivals. Other attractive benefits of this unit are lightweight, low noise level, low price, sleek design. Similar to other tire inflaters, this unit has the entire package features: auto shut-off, digital display, LED lights, 4 measure units. Currently, this model has a small discount up to 18% off the listing price. Air compressors are mandatory in garages, workshop, auto-repair business but picking the right one that fits your current demand can be challenging. They vary in design, function, benefits and performance and durability. Therefore, before choosing any deal, discount, you should have a look at different types of air compressors to have a better understanding. Pneumatic machines like air pumps, air compressor, tire inflators do not have a deep discount for the whole year, therefore Black Friday is the best chance to look for them at the lowest price possible. There are many brands offer portable air compressors at different size and uses like CAT, Dewalt, Porter Cable, Makita, Campbell Hausfeld… Most of them will have discounts on regular, small size compressors for the garage, DIY workshop, home use. On Black Friday, you can grab some models with deep discount up to 40% off regular price. Our recommendation is California Air Tools 5510SE for its performance and price value. Industrial air compressors hardly ever had a deep discount on Black Friday but as they are very expensive (up to over 2000 dollars), just 10% discount of them will save you a lot of money. Some famous brands offer industrial air compressor for large garages such as Campbell Hausfeld, Ingersoll Rand, Dewalt, Industrial Air. Wheel and Tire air compressors are very convenient and easy to use. These machines are inexpensive therefore you may pick a junk if just paying too much for the discounts. To choose the best one on Black Friday, you should check for the reviews, popularity and the benefits of the machine. 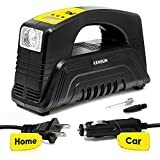 There are a few models that have the super high rating and low price (under 50 bucks) like EPAuto 12DC model, Kensun AC/DC model, Oasser air compressor handheld model.